Wassily Kandinsky (1866-1944) was an influential Russian painter and art theorist. He is generally credited with creating the first purely abstract paintings. Kandinsky painted a series of ten "compositions" that explore the nature of color and abstraction. 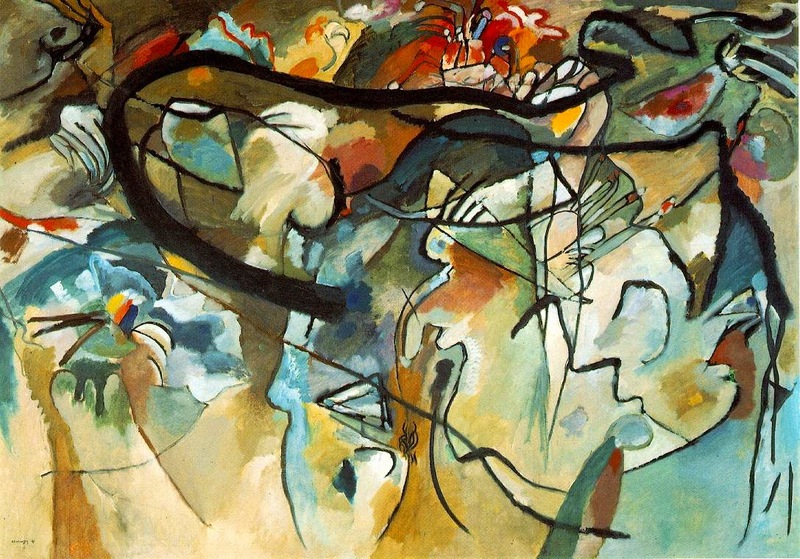 Composition V was exhibited in the first exhibition of the art group Kandinsky founded, called Der Blaue Reiter (The Blue Rider), named for Kandinsky's and Franz Marc's shared love of horses, riders, and the color blue, which Kandinsky felt was the color of spirituality. This painting was produced in the same year that Kandinsky published his important treatise, On the Spiritual in Art. He discussed the importance of abstract art, writing that creativity exists outside of the conscious mind and beyond our ability to describe it in language. Kandinsky argues for a type of picture that would not be expressible in words and that is no longer a picture of something. Composition V is part of that objective. There are some recognizable forms in the piece (people can be discerned near the top), but overall, there is no identifiable subject of this painting. Some scholars have seen a scene of death and rebirth, seeing those people as angels blowing trumpets. Ideas about death and resurrection may be present, but in my view they are not the primary force of the work. Instead, I see a declaration of the power of spirituality in the face of death and the unyielding flow of time. The complex composition of the canvas contains many themes, and one of the virtues of abstraction is it invites the viewer's subjectivity. When I look at this painting, I see beauty in chaos. As the application of paint thins toward the bottom of the canvas, I see our vantage point, where we can witness the universe spinning around us, luminous.